Click here for instructions from WePay. To begin to withdraw your funds, first link a bank account. Click the "Provide information" link in the yellow box above your next withdrawal. This will be in the upper right of your account. Also, you can click the Settings tab (the big gear icon) in the top right, and head over to the section named "Withdrawals." If you haven't already, it'll ask you to fill out some information for the Trust Center on your account. This will help eliminate risk and protect your account. You'll be asked to add the appropriate account information, such as the name of the bank, routing number, account number, and whether it's a checking or savings account. Make sure you enter in the electronic routing number! That's the routing number used for automatic payments like direct deposit. You may also set how frequently money will be sent to your bank account. 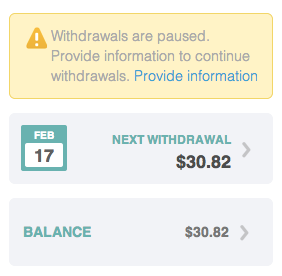 You can pick daily, weekly, or monthly withdrawals, just as long as money is available when that time comes around. If you have any problems with this setup, feel free to submit a request for some assistance with the link below.